Thanks jiminks. This sounds like a good presentation of Virginia, fairly complex though mild. This will be sold as a pouch tobacco I surmise? Thanks for the news.I like thier original mixture,and will be looking out for this.The full aroma is not bad either if you want to rotate to an aromatic for a change.Hey,I’ve clawed my way up to junior member! MSO: it'll be sold in pouches like the other Amphora blends. Any comparisons to Virginia #1, HH Pure Virginia, or Virginia Flake? Cortez: it has some of the same family notes as Virginia #1, but it's less spicy, a tad less sweeter, and will not bite even if pushed. It was designed to be an all day, pleasant smoking experience. Thanks for this interesting review. This was the very first tobacco I smoked in my very first pipe a couple of months back. I'm fortunate to have an excellent B&M nearby here in Copenhagen and this was recommended to me as a good place to start. I've tried several different blends since, but this is still one of my favorites and a very pleasant smoke. 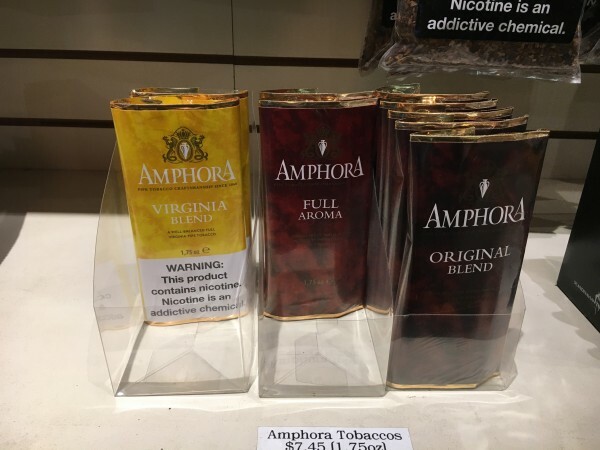 Another example of quality blend by Mc Baren,Thank You for taking time to review this 'consumer friendly'Amphora offering. Good review, looking forward to trying some. Yeah I'm looking forward to trying this too. Thanks,Jim. I have been interested in trying this for a while - am more so,now. Looking forward to try this pouch! Thanks for the heads-up and the review. Jim, I got to try this at the Chicago 2018 pipeshow. I absolutely love this stuff. A lovely smoke with plenty of character. Hints of sweetness and notes of chocolate for me. I don’t think I’ve ever enjoyed a smoke as good as this before - at least for my tastes and palette. I’m eagerly waiting for this to hit the market! Thanks for your review! You're very welcome. I like the blend, too. I just bought a pouch of Amphora Virginia from Iwan Ries in Chicago. They don’t have it’s listed on their website but you can buy it in store. They haven’t listed it on the website due to limited stock. The price is below $8 and unfortunately it has a pretty big ugly warning label. No matter - the tobacco is delicious! A good Virginia at a fairly easy price. What's not to like? I'm not much of a Virginia smoker, but this is a nice, mellow, mild, slightly sweet smoke. Slow burn, comforting aroma, doesn't require much drying. Probably boring to the palate of a Virginia maven, but very pleasing to me. After reading this thread i had to try some and now have 2 pouches from SP. MacBaren has created a broken flake that is just lovely and is a pleasure to smoke. It approaches that high level that the older tobacco blenders [G&H, SG) are so good at---the time-honored method of hot pressing to marry the flavors. Slow sipping brings out a delicate subtle range of flavors. It also has a great room note to boot. Step up to some really fine tobacco. I'm most of the way through a pouch of it. Very good VA for the price. Nice grassy/hay notes that are accompanied by the stewed fruit notes. To me the nic hit is on the stronger side of mild. I've noticed the blend tends to burn for a long time at least for me personally. A bowl that a ribbon would normally last 45mins to an hour ends up going about 90mins to two hours. As stated, it's a very good VA blend. Definitely recommend picking up a pouch or two.